The first prototype of the Pop-Up Landscapes installation was constructed at Hangar, media production and residency space, Barcelona. The main goal of this first stage is to create two similar interconnected spaces, in which people can actively participate in environmental change. Each environment (A and B) is made up of a carpet of nine-sensor tiles and an interactive projection. Depending on where a person stands on the carpet they activate a triptych panoramic image of the Poble Nou urban landscape. This allows the spectator/intervener to manipulate and expose visual layers according to their action. 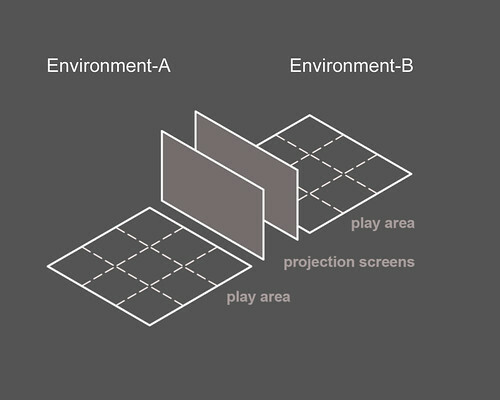 Participant’s actions in either A or B will influence changes in both projected environments, allowing for a game dynamics to emerge between the two spaces and the people involved. During the workshop at Hangar (26-29 Feb) we publicly tested the mechanics of the installation (software; PD software and hardware; wooden sensor tiles) and the game play it supported. Overall we received very positive feedback from the first test and workshop. The approach the project takes to the themes of landscape and survival were complemented by the team of professionals (architects, designers and researchers) who attend the workshop. For some of these professionals they could also see how the installation could transfer within their own practice and/or be used as a means to supporting community participation in the design of their built environment. The outcomes of this test also showed, as we anticipated that we need explore other forms of visualizations and environmental representation. Reducing visual confusion so that participants are clear how their input influences the projection and communicates with a remote other, also needs requires further work. 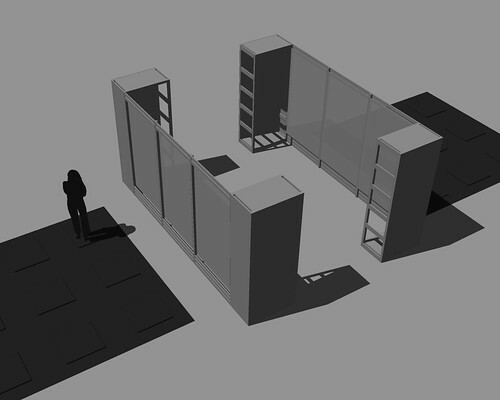 The second test of the installation prototype has been carried out during the EME3: COLLAPSE, Architecture Festival. The purpose of this second public test of the installation was to ‘stress’ sensors tiles, which we now have converted from wood to PVC, as the wood was too sensitive to environmental conditions (room temperature etc). The three-day, ‘stress test’ also showed that we needed to further refine the sensitivity and calibration of the sensors. The third test of the installation prototype will take place at Mação, Portugal. This third test, extends those carried out at EME3 by allowing us to further test the sensors (sensitivity, calibration, reaction to different glues and materials). We are also testing how single frame images, rather than a panoramic can be inserted and worked in the installation. We are also carrying out further tests on the use of effects such as fragmentation and overlay.